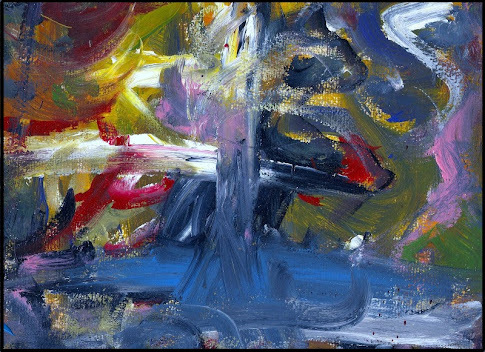 Julianne Richards: "The Colorspeaker": "An experiment in chaos"
I was hesitant to even post it-I am not sure what I think of it, but I know this-It was fun to do- and completely unstructured. I actually had a painting underneath it. 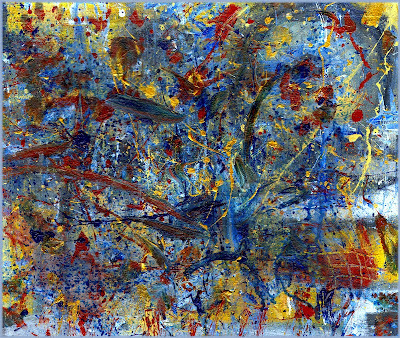 Then, after leaving my studio for a while, upon returning, I just began taking my brushes and dipping them into colors heavy with paint and just flinging them onto the canvas, letting the streaks fall from the brush wherever they may...I am not a huge Pollock follower, but seeing this, I know it will seem connected. I am, however, a fan of "the late and Great Joan Mitchell," and perhaps, just maybe, this is a humble (and simple) refection of my admiration of her free-form abstract style. If you are not familiar with her work, I recommend getting acquainted with it if interested. She was, and is, a true "Abstract Expressionist" of the 20th century. I like it actually - worth repeating and taking it further? This one evokes an immediate "Ahhhhh" from me. I agree with Philip - more!